The number one priority for your children is safety. You don’t want to lose sleep worrying about your kid’s safety while they sleep. Make sure the top bunk has sturdy rails. One wide rail or several smaller rails should be enough. Also, make sure you feel comfortable with the sturdiness of the beds. Most will be safe, but depending on the frame style some appear more sturdy than others. You may want to choose a heavier wooden frame bunk bed rather than a lighter weight metal frame bed. All bunk beds should have a staircase or ladder that can allow easy access and exit for your child. If you have a younger child, make sure the design is appropriate for their age. Do want extra storage? Many bunk beds come with drawers fitted in the bottom. Some have broad staircases with drawers or cabinets on the side. If you only need one sleeping space, the captain’s bed pictured provides plenty of extra storage and a fun place to sleep. You can also find lofted beds with desks underneath. There are a lot of unique, beautiful bunk bed designs on the market. You don’t have to sacrifice style for space. Apartment Therapy provides a list of trendy bunk beds in this post. 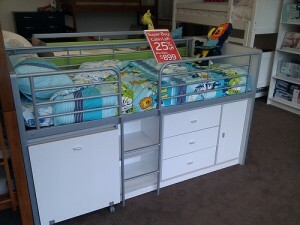 One convenient feature to look for is the ability to detach the bunk beds and use them as individual freestanding beds. 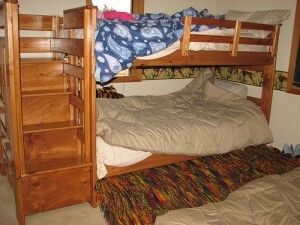 When you kids outgrow sharing a room or some free space opens up you won’t have to buy new beds. Most bunk beds come in a standard twin size, but some are extra long or full size. Be sure to clarify when you are purchasing the beds. Knowing the right size will be essential when buying bedding. Bunk beds can be a great investment to free up some needed space in your household. Take care as you shop to find a bunk bed that you love for its style and safety features. If you take you time and find what you are looking for, bunk beds can be a fun part of your home for a long time. January 24, 2013 | Posted by Lee C.
Clutter happens everywhere, on the kitchen table, the desk in the den and the top of the dresser in the bedroom. When a bedroom is small clutter can feel especially suffocating. The following are a few decorating tips that can resolve clutter issues and make your space feel larger. Stylish baskets are an easy way to contain clutter. 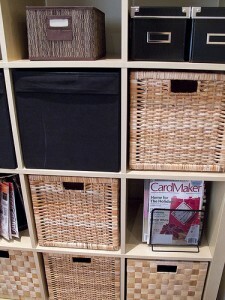 Choose a few small baskets to place on top of your dresser or nightstand. These can hold the items that normally get left out every night like keys and cell phones. Large baskets can be placed on the floor to hold extra blankets and pillows or even shoes. If you have a tall bed frame, Better Homes and Gardens recommends, baskets for a sophisticated way to hide out of season clothes under the bed. The nightstand is functional, but can take up a lot of space without providing much storage. Consider placing a small dresser next to the bed instead. The Decoist suggests using bookshelves on either side of the bed. The shelves will provide plenty of storage and the height will draw the eye up making the room appear bigger. Get rid of the bedroom decor that isn’t necessary. Having less furniture in your room will free up more space. Today Home and Garden urges small bedroom owners to avoid using footboards. You can also avoid using a headboard by replacing it with art hung above the bed or even painting the wall to appear like a headboard. You can also replace a headboard with shelves. The space behind the bed can double as decoration and storage. Cloth bins or knit baskets placed on the shelves are attractive ways to hide miscellaneous items. If you lack closet space, you can hang a curtain rod with an attractive curtain to hide clothing hung on hooks or another curtain rod. Rolling bins and other plastic storage can also be hidden in this makeshift closet space. Curtains can also be hung behind the bed to create the illusion of a larger room. These are just a few tips for making a small space feel a little bigger. Adding extra storage and multifunctional furniture will help cut down on the clutter and help your bedroom feel more homey. Less clutter and more space may mean a more relaxed night of sleep. Help your bedroom remain a sanctuary for rest rather than a gathering place for piles. Even if your bedroom is small there is always room for some organization. 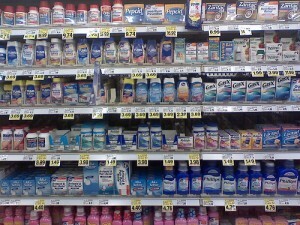 January 19, 2013 | Posted by Lee C.
Acid reflux keeps many people awake at night. According to WebMD, “60 million Americans experience acid reflux symptoms at least once a month.” These symptoms can cause burning sensations in the chest, or just an uncomfortable feeling in the stomach. Aside from over the counter drugs, there are a few ways you can prevent acid reflux and sleep better. Acid reflux is caused by stomach acids entering the esophagus. There is a muscle that acts as a barrier that normally prevents this from happening. However, at night this muscle can relax. Also, because the body is laying flat, gravity is no longer working to keeping stomach acids down. These two factors can cause people to experience more acid reflux at night than other times of the day. The discomfort that occurs can often get in the way of sleeping well. There are wedge pillows available for purchase. These pillows elevate the esophagus above the stomach preventing reflux. However, there is no research on the long term effects the pillows have on the spine. And, according to Health Guidance, some doctors think the pillows may even cause the symptoms to be more severe. A cheaper and more effective alternative to the wedge pillow is simply elevating the head of the bed. Lifting the legs of your bed frame just a few inches with some bricks or boards should elevate your body enough to keep stomach acids down. You can also adjust what you eat. Because a full stomach can cause acid reflux, avoid eating large meals close to bed time. If you experience reflux throughout the day, try eating several small meals instead of a few large ones. WebMD suggests avoiding chocolate, citrus fruits, caffeinated drinks, alcohol, spicy foods, fatty foods, garlic, onions, peppermint and tomatoes. Smoking can also cause acid reflux and more seriously esophageal cancer. Health Guidance states that nicotine relaxes the muscle that prevents acid from entering the esophagus and dries out saliva, which helps neutralizes stomach acids. If acid reflux keeps you from sleeping every night, you should consult a doctor. Untreated severe acid reflux can cause more long term problems in the esophagus. Even if you don’t experience acid reflux regularly, just about everyone has discomfort every now and then. Knowing what causes acid reflux and how to avoid it can help you get a better night’s sleep. Finding a gift for a friend, relative or coworker can be a difficult task. It can be hard to think of something creative and personal. Handcrafted gifts can make gift giving easier because each gift is one of a kind. Giving a handcrafted item will send the message that you went out of your way to find something significant for the person you care about. You can make your own handcrafted gifts if you are a talented artist, knitter, sewer, baker or even scrapbooker. People will feel loved when they know you spent time making them something special. You will also get to enjoy spending time practicing your hobby. However, there are often times when you don’t have the time to make something yourself or perhaps you need some more practice at your craft before you are ready to give your work away. In those situations there are other options for finding that special one of a kind, unique handmade gift. Handmade woodwork is high quality, uniquely designed, and when purchased from a small business owner can often be custom ordered. 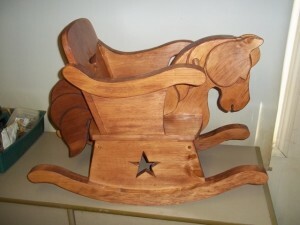 Backyard Wood Designs offers a wide variety of gift options. They handcraft beautiful ornaments, gifts for children, decorative wooden bowls, outdoor decor, and many one of a kind gift items. 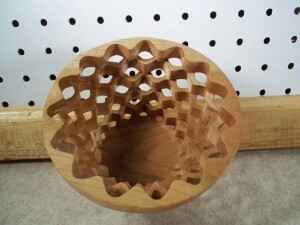 Handmade wood crafts are sturdier and are higher quality than gifts bought at big box stores. These unique, beautiful gifts can be handed down from generation to generation and will stay in a family for years because of their heirloom quality. ArtFire is another great place to find unique handmade gifts. It is an interactive handmade market place and a craft community where you will find thousands of beautiful and unique handcrafted items, ranging from wardrobe accessories to household items, handmade furniture, and more. Buying a handcrafted gift ensures that your gift will be one of a kind. You can show your loved ones that you took the time to find something special just for them. What is the best gift you have ever given? January 9, 2013 | Posted by Lee C.
You may have heard that you shouldn’t eat after dinner. That doing so will cause weight gain, heartburn, and maybe even bad dreams. It is true that you don’t want to eat a large amount of heavy foods before bed, but a light bedtime snack could help you sleep better. Your digestive system slows down at night. This is why you don’t want to eat a large meal shortly before gong to bed. The meal will sit heavily in your stomach, and possibly give you heartburn, both of which will keep you awake at night. However, if you are hungry, your body may signal that you need to wake up and you will have difficulty falling back to sleep if you don’t eat something. To prevent this from happening, you can eat a light snack shortly before bed. There are some foods that will help you sleep better than others. You should avoid foods high in fats and sugars. 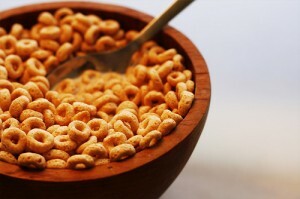 Fat is difficult to digest, and sugar will send your blood sugar soaring and then plummeting which will wake you up. WebMD suggests that carbohydrates and dairy raise your levels of tryptophan, which can help you sleep. Be careful to avoid anything caffeinated even in small amounts, especially if you are sensitive. Chocolate, or even decaffeinated coffees or teas may have enough caffeine to disrupt your sleep. If you would like to drink tea, use an herbal tea such as chamomile or peppermint, instead of decaffeinated black or green teas. Some snacks that will help you sleep well include crackers, a small bowl of milk and cereal, toast, and small bits of diary such as cottage cheese or a little bit of hard cheese with your crackers. MedicineNet claims bananas, honey, eggs, and nuts as excellent sources of tryptophan. Muffins or bagels with a small amount of peanut butter can also be a good late evening snack. Remember to keep your night time snacks light, and try to pair carbohydrates with dairy. There is wisdom in drinking a warm glass of milk with a piece of toast before bed! Do you have a favorite bedtime snack? January 5, 2013 | Posted by Lee C.
Cold nights are settling in for the rest of the winter season. In this cool weather you want your home to feel as warm and cozy as possible. However, with utility bills always increasing and energy efficiency on everyone’s mind, turning the thermostat down at night is a common habit. It is a good habit for many reasons, but turning the thermostat down may still leave you feeling cold and uncomfortable in bed while you fall asleep. Being too cold at night may even interrupt your sleep. A heated mattress pad can warm up your bed before you go to sleep so you can drift off comfortably, even when the thermostat is low. Heated mattress pads offer a few advantages that traditional electric blankets don’t. Heat rises, so when you use an electric blanket much of the heat is lost out of the top of the bed. A heated blanket requires more energy to keep the bed and your body warm than a heated mattress pad. Because the mattress pad is on the lowest surface of the bedding it warms all of the layers of bedding from the fitted sheet to the comforter. If you turn it on before you go to bed, the entire bed will be heated before you lay down. 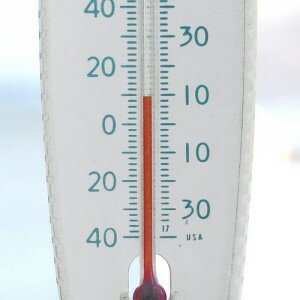 The heat is then trapped between the mattress and the comforter perfectly warming your entire body. Heated mattress pads are also ideal for people who suffer from neck, back and joint pain. The warmth comes from below so it is directly applied to the pain stricken areas. Arthritis Today also suggests using heat to relieve pain stating, “Warming tissues eases arthritis pain by increasing blood flow to affected areas, which can help decrease inflammation, relax tight muscles and eliminate waste products such as lactic acid that cause stiffness and soreness.” Heated mattress pads can provide continuous even heat to sore joints and aching muscles throughout the night. An electric blanket is great for cuddling on the couch and has many uses, but if you want to turn the thermostat down and settle in for a warm, efficient night of sleep a heated mattress pad will more effectively do the job. Welcoming a new baby into the house is an incredibly joyful time, but it can also result in many sleepless, or at the very least sleep interrupted nights. Days on end of sleep deprivation can lead to some serious consequences, but there are a few things you can do to help. Lack of sleep can lead to irritability and even depression, new moms are especially susceptible to postpartum depression. Loss of sleep can also lead to dangerous, drowsy driving when carting your family around. To avoid serious problems, know when you have reached your limits and when you need help. If you are too tired to run errands, ask a neighbor to go for you. If you feel emotionally unstable, or severely depressed talk to you doctor as soon as possible to get help. If you are just feeling tired, or a little irritable there are a few tricks you can use to get a few hours of sleep and catch up. Most new moms have heard it over and over again; sleep while the baby is sleeping, but this is often easier said than done. If you need the rest, do your best to not feel guilty about the other chores you think you should be doing, just go to sleep. It may feel odd to go to bed at 7:30 at night, but you will not regret it when the baby wakes up for a few hours at 12:00 am. If you have other children, this may be even more of a problem. Consider hiring a babysitter, asking a neighbor, or scheduling a playdate at a friend’s house so you can nap for a few hours during the day if you need to. If you are napping during the day, be sure to find a dark, quiet spot so that you can rest easily. WebMD recommends not taking on any responsibilities when you have a new baby at home. If you are in charge of any committees at your older children’s school, or are a regular volunteer somewhere, consider taking a break for a few months, until everyone’s schedule has adjusted to having a new member around the household. Marc Weissbluth in “Healthy Sleep Habits, Happy Child” suggests that new mothers allow someone else to take on at least one feeding every 24 hours. This can be during the day or at night. Either way, use this time to take a break and catch up on some sleep. No matter what, never be afraid to ask for and accept help. If its with dishes, help with older children, or a partner handling a midnight feeding, accept it gracefully and get a few hours of sleep while you can. The more well rested you are, the healthier you will be and the more you can enjoy the new baby that has become an important member of your home!